Back in Settle Victoria Hall, this time for a band I've seen before. They had everyone dancing: from teenagers right up to eighty-somethings. The music scarcely stopped, band members switching instruments seamlessly without waiting for applause at the end of a song. By the end, everyone was exhausted, and everyone was grinning. 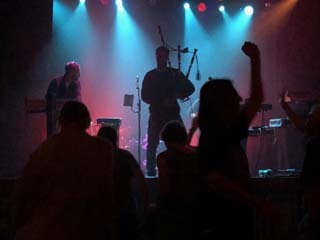 Even if the thought of Gaelic electronic dance music with bagpipes and poems doesn't sound appealing, go and see Niteworks anyway; you will be converted. Posted by pab at 22:15 | Comments will be back one day. Please email me instead!